Q. Father, please explain what is the sacrament of Extreme Unction? The sacrament of Extreme Unction is the anointing of the sick with holy oils, accompanied with prayer.When is Extreme Unction given? Extreme Unction is given when we are in danger of death by sickness.When a Catholic is seriously ill, the priest is sent for, if he does not already know of the illness. He takes with him the Blessed Sacrament and a little vessel containing the “Oil of the sick”, which is specially consecrated for this purpose by the bishop on Holy Thursday. 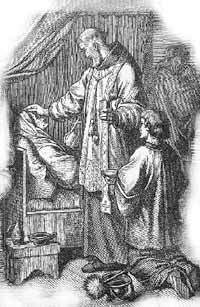 The priest first hears the confession of the sick person, absolves him and then gives him Holy Communion (called in this case Viaticum, or Food for the Journey to Heaven). He then anoints the sick man with the sacred oil, or gives him, as we say, Extreme Unction (that is, the Last Anointing). He makes the sign of the cross with the oil on the eyes, ears, nostrils, lips, hands, and feet, saying during each anointing “By this holy anointing and by His loving mercy may the Lord pardon thee whatever thou host committed by sight, hearing”, etc. The sacrament is given only to those who are in danger of death from sickness or accident. A soldier who is going into action, even though there is every probability of his being killed, cannot be anointed; if he is mortally wounded, he can then receive the sacrament.What are the effects of the sacrament of Extreme Unction? The effects of the sacrament of Extreme Unction are to comfort and strengthen the soul, to remit sin, and even to restore health when God sees it to be expedient. The effects of the sacrament which we saw in the last question are all here indicated. It is for the sick that is, for the seriously ill, as the original Greek text makes clear. The priests pray over him and anoint him. The effect is to “save” him, the Lord raising him up – that is, conferring on him spiritual strength and consolation, and, if God sees well, restoring his bodily health. It will forgive his sins, too, when the normal sacrament (Penance) cannot be conferred. That this rite is a sacrament is clear, because here there is an outward sign (prayer and the anointing) working an inward effect (comforting and strengthening the soul by grace, and even remitting sins), and ordained by Christ, for only God can give to an outward sign the power to confer His grace.So we see how wonderfully the Catholic Church can help and succour the dying. The marked contrast between what the priest can do at a deathbed and what the non-Catholic clergyman can do has often been noted and remarked on by non-Catholics. The sacrament can still be given even after the doctor has pronounced the person dead, since it may be some hours before the soul actually leaves the body. The priest completes his ministrations to the sick by conferring the “apostolic blessing for the hour of death” – that is, the Pope’s blessing, conveying a plenary indulgence.